Spring rolls used to be one of those things we always got at restaurants but figured we would never be able to make at home. Something about the crispy texture, refreshing flavors, and weird, but strangely addictive wrapper made these little rolls so intimidating. 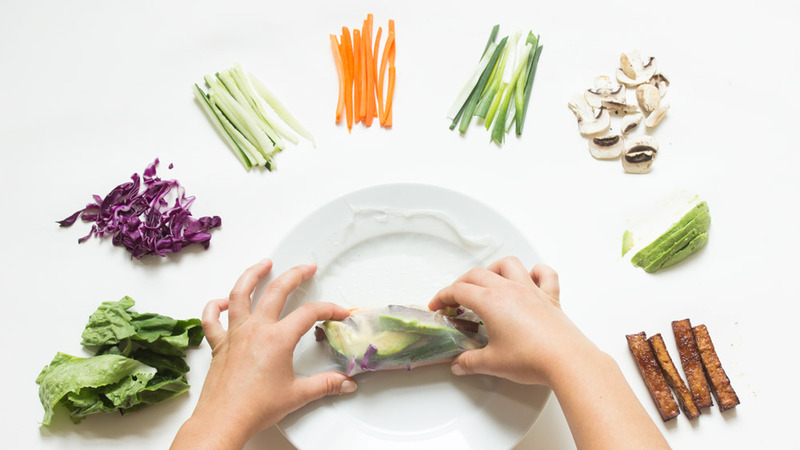 The more spring rolls we ate, the more we wanted to re-create them in our kitchen. So one day, we ordered spring rolls and seriously investigated the ingredients. They were so simple, made with raw vegetables and a protein. Now the only obstacle was the wrapper, but fortunately we have the internet! A quick Google search showed that spring rolls were wrapped in rice paper that needs re-hydrated. 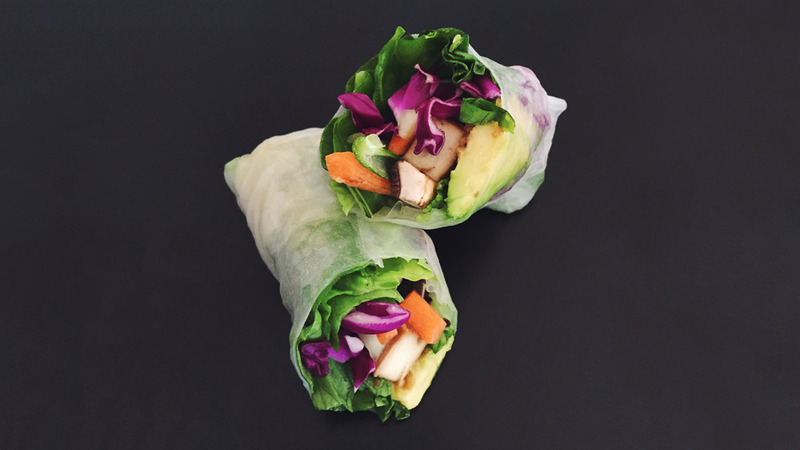 Raw veggies and a rice paper burrito shell, anyone can make spring rolls! The recipe below makes our usual spring rolls, the type of spring rolls you might find in a Vietnamese restaurant. Like all of our favorite recipes, spring rolls are extremely versatile. They allow for ingredients to be left out, swapped, or completely new flavors incorporated. Because you make each roll individually they are perfect for picky eaters or catering to both vegetarians and meat-eaters. 1/3 cup of cilantro, mint or both! Mix together Hoisin sauce, Peanut butter, and soy sauce. Keep in fridge until ready to serve. When the oven is to the correct temperature, remove the tofu from the marinade and place on a greased baking sheet. Bake the tofu for 30 minutes, flipping at least once during the cooking process. While the tofu is baking, julienne the carrots, cucumber, mushrooms and green onions green onions. Wait until you are ready to assemble the spring rolls to cut the avocado because it will begin to brown. When the tofu is finished, slice them into thirds lengthwise. 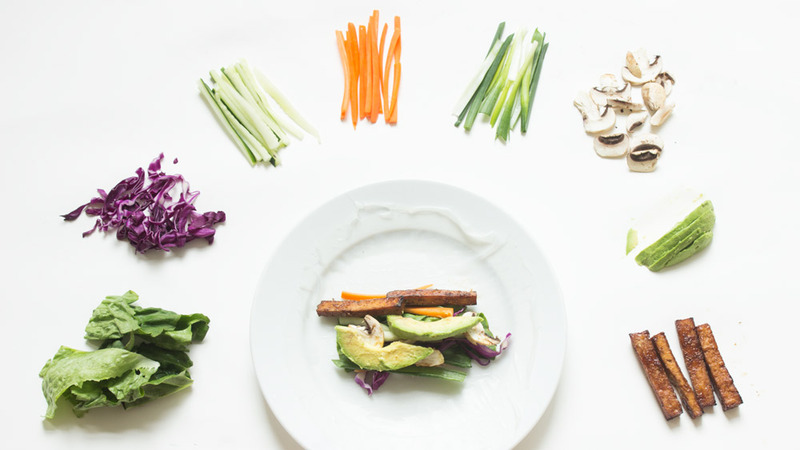 You will want all of your ingredients in long, thin strips, except for the leafy greens. Now that your ingredients are prepared, it is time to organize your work station. It is best to have a large area to work with. Your ingredients should be easy to reach but remain separate. I prefer to have mine in order of how I will stuff my rolls so I line up my water, greens, carrots, cucumber, onions, tofu, avocado, cilantro. You are now ready to assemble! First you need to re-hydrate the rice paper. Soak the paper in a shallow bowl of warm water for about a minute. The paper should become completely transparent and very malleable. Lay the rice paper on a flat surface and begin filling it with your ingredients. Wrapping the spring rolls is just like wrapping a burrito so use the same techniques. Keep your fillings in a neat line, roll one side of the rice paper, covering the fillings, fold in the sides and finish rolling the rest of the paper. Set aside and continue until you use up the fillings you have. This will take some practice before you have the perfect looking rolls but they will still taste amazing! You can serve them right away with the peanut sauce or individually cover the rolls in aluminum foil or parchment paper and store them in the fridge for up to three days. ← clean out your fridge – quiche! Thanks Ab! They are absolutely delicious! If you try it out, let us know how you like it. FYI we just posted a sushi recipe which is similar in a lot of ways!